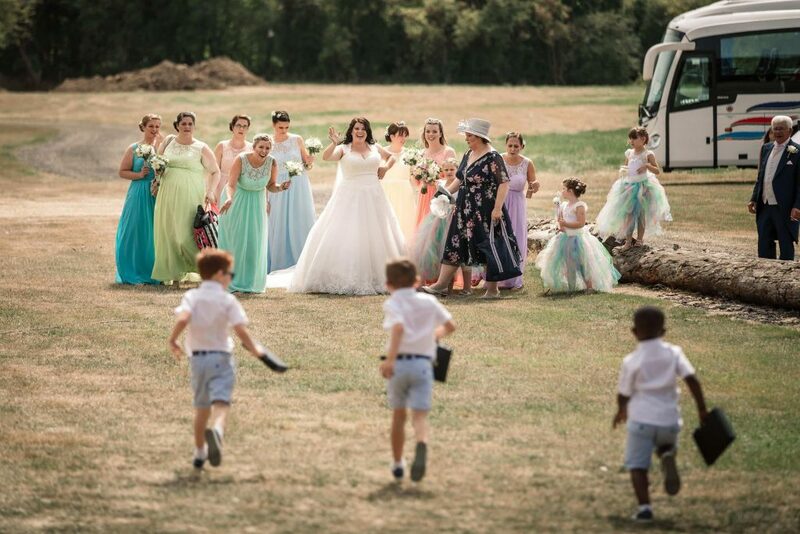 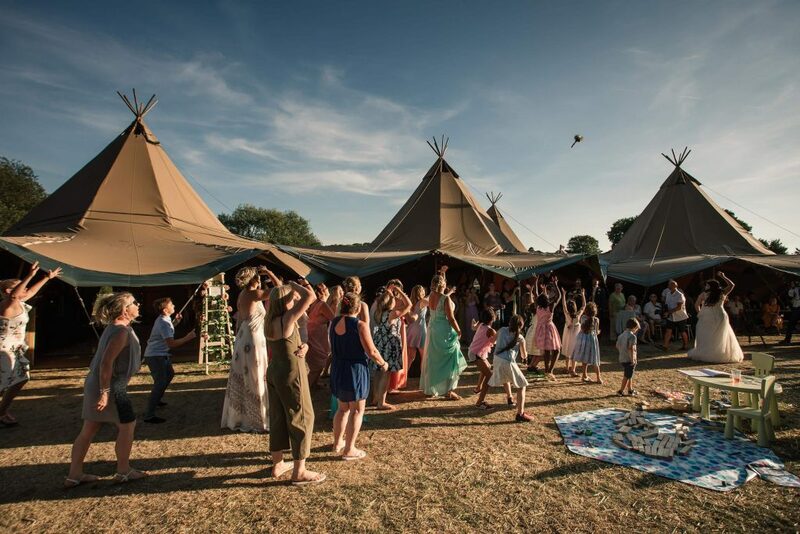 If you love festivals then you’ll adore this amazing Brook Farm Festival Wedding – a big family celebration! 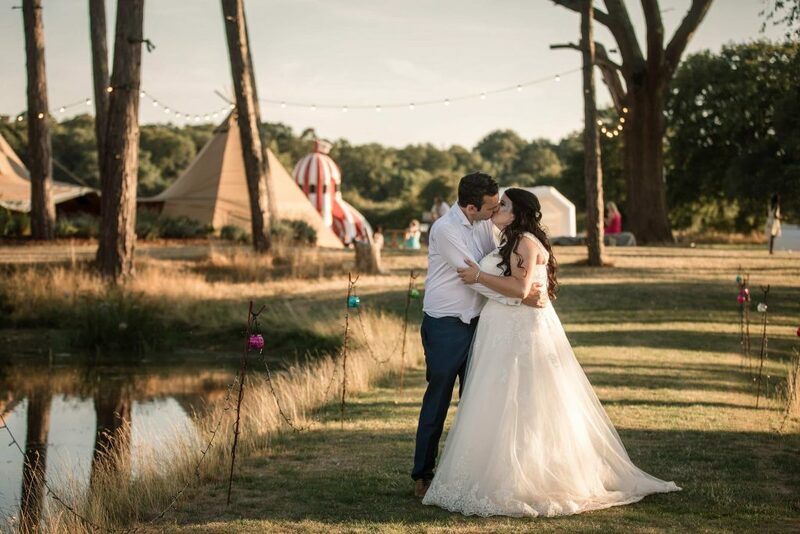 Claire and Martin got married at the beautiful Brook Farm, Cuffley, Hertfordshire, in August last year. 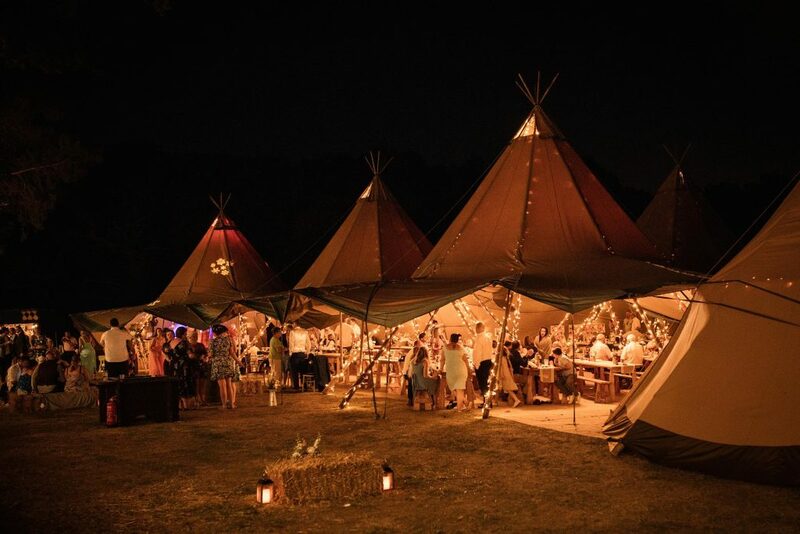 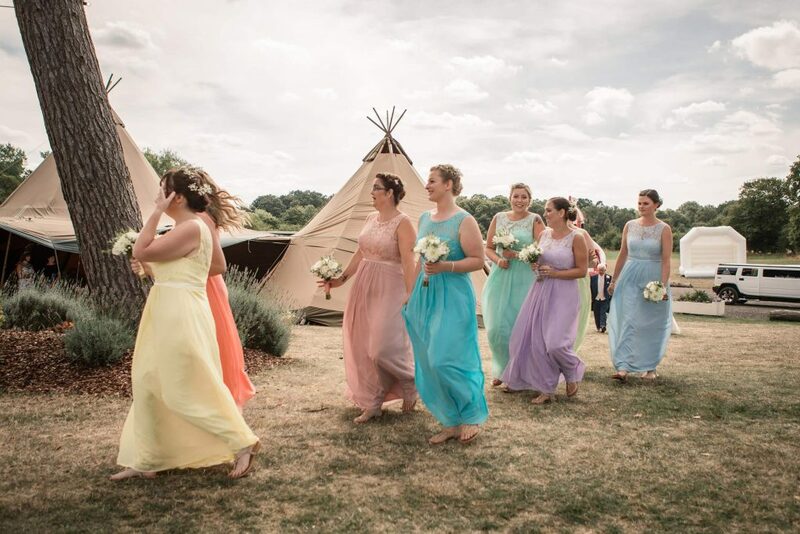 It was a brilliant tipi festival wedding, with so much colour everywhere and a real party vibe. 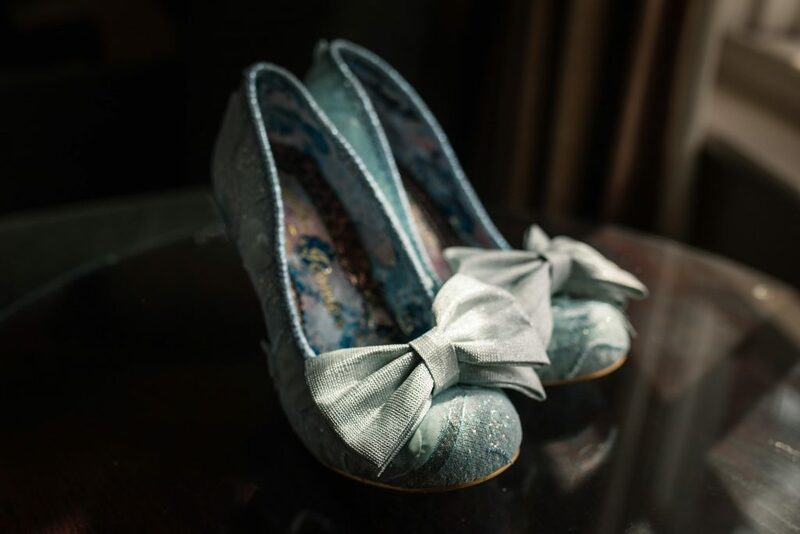 Claire got ready in a nearby hotel with her entourage of bridesmaids, and there was such an exciting vibe. 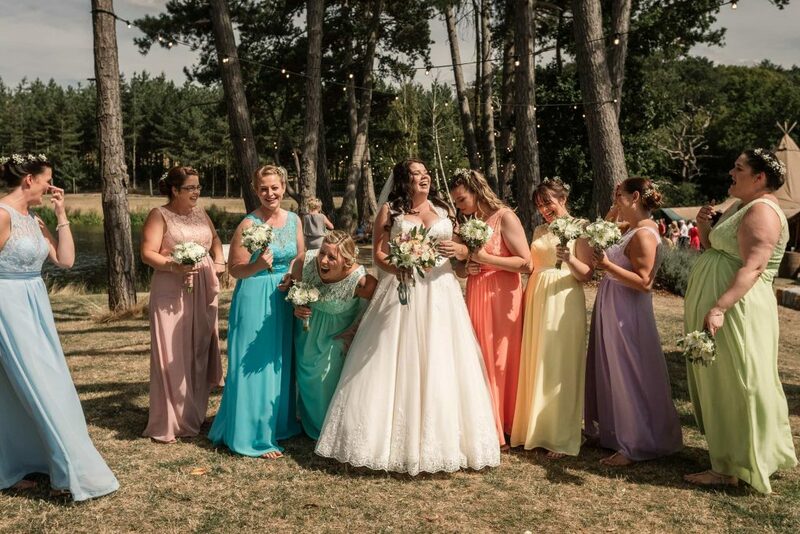 I loved how all the girls were in different coloured dresses. 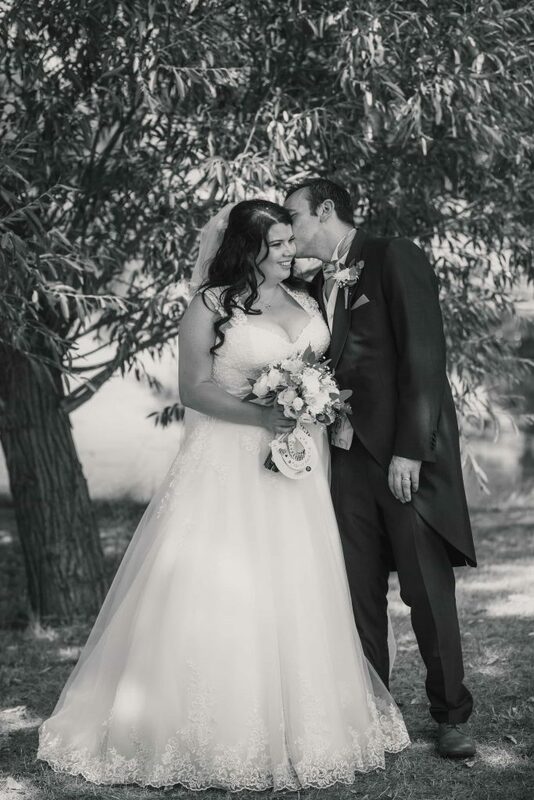 I think Claire was a little nervous, but she was still quite calm and composed in the morning as she was getting ready. 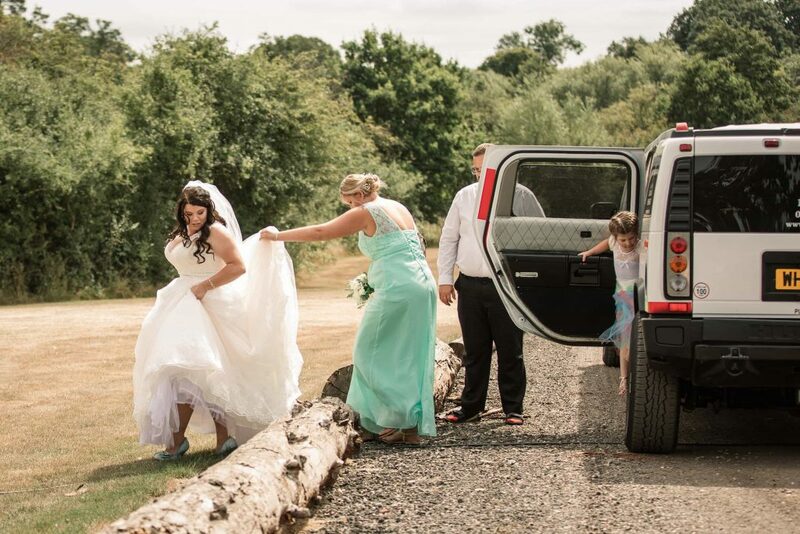 Once the preparations were completed, she hopped into her wedding transport a stretch hummer to get to the ceremony a short distance away at Brook Farm. 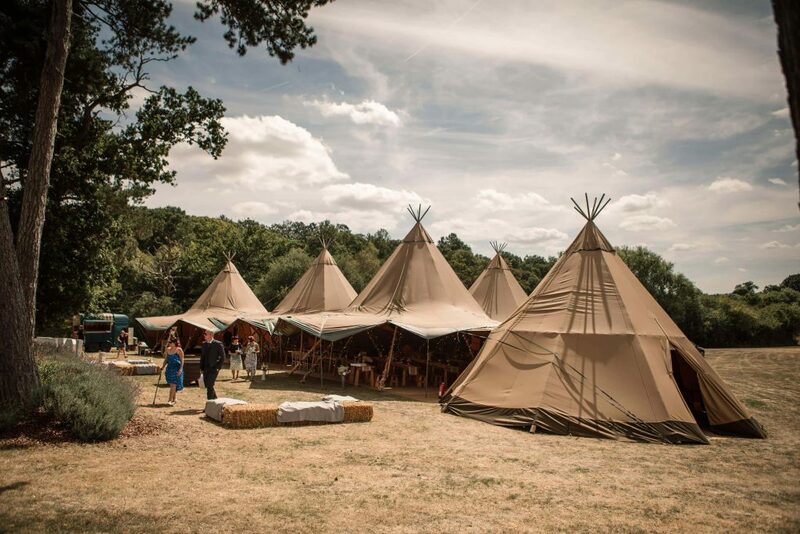 Martin arrived early with his groomsmen to attend to last minute set up details and get everything sorted at the venue. 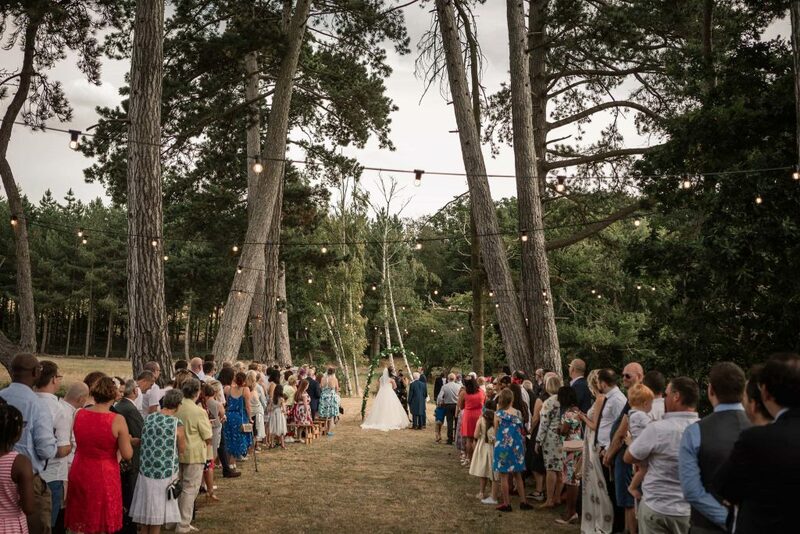 It had been a real team effort to set up the day, with all the wedding party on site the day before to arrange everything. 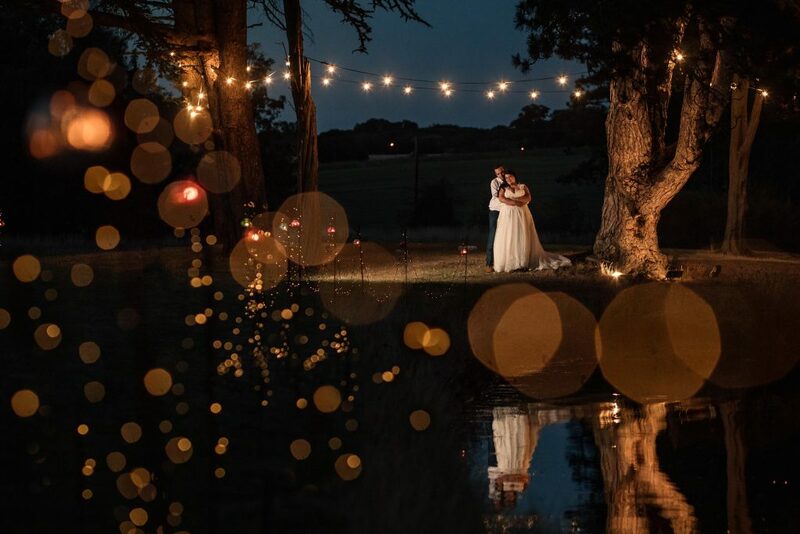 It all looked amazing! 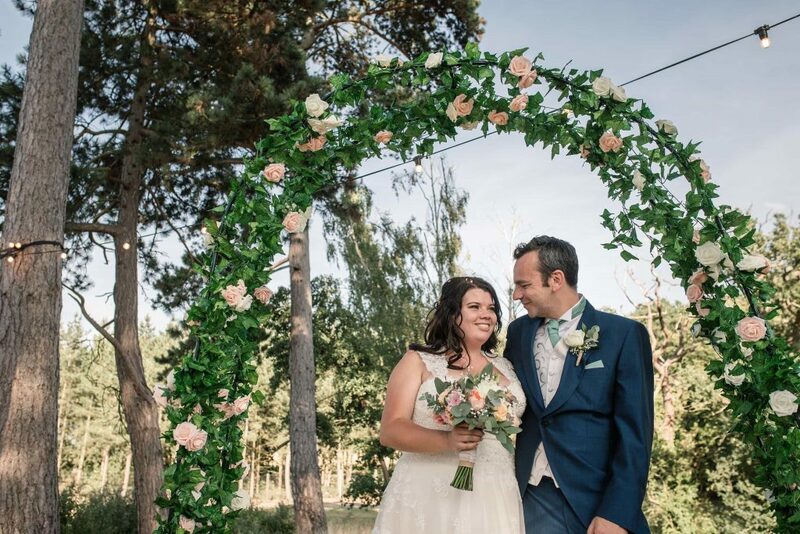 The ceremony took place under an archway in the tree lined boulevard at Brook Farm. 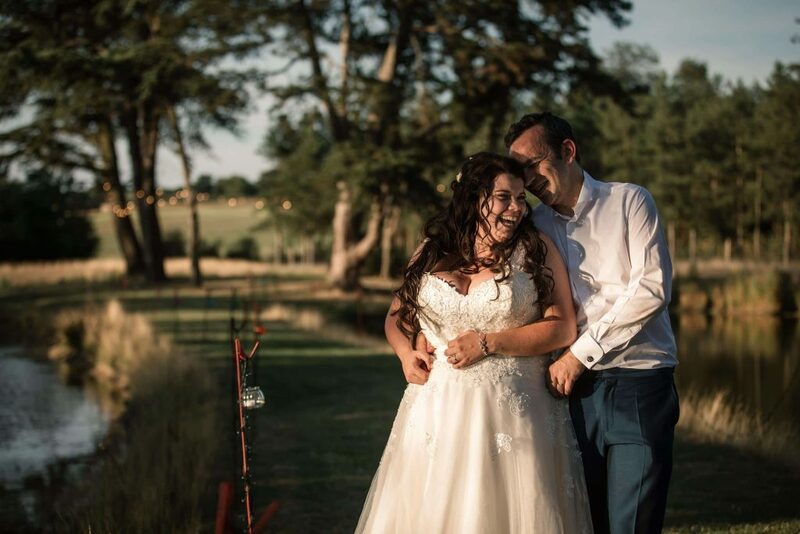 Everything was outdoors, which was so perfect on such a beautiful sunny day. 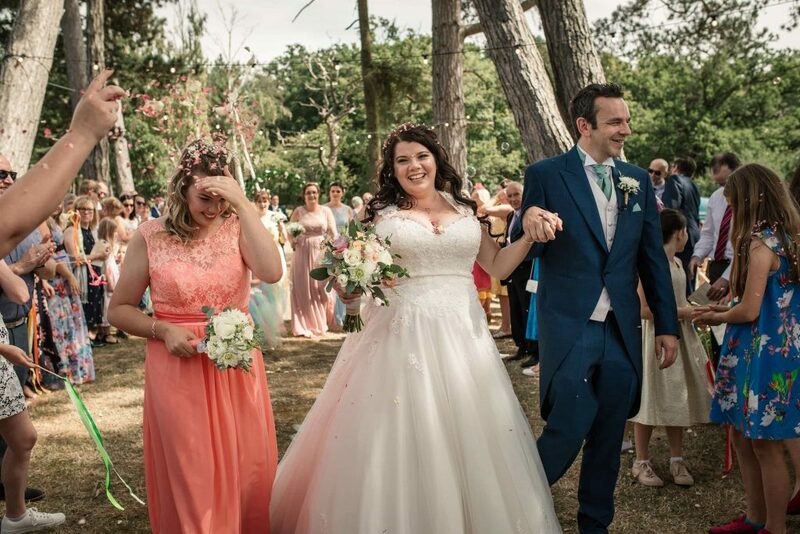 Claire walked down the aisle to the sound of a gospel choir, and the ceremony began with the couple saying personal vows they’d written themselves, and finished with them walking down the aisle and being showered with colourful confetti. 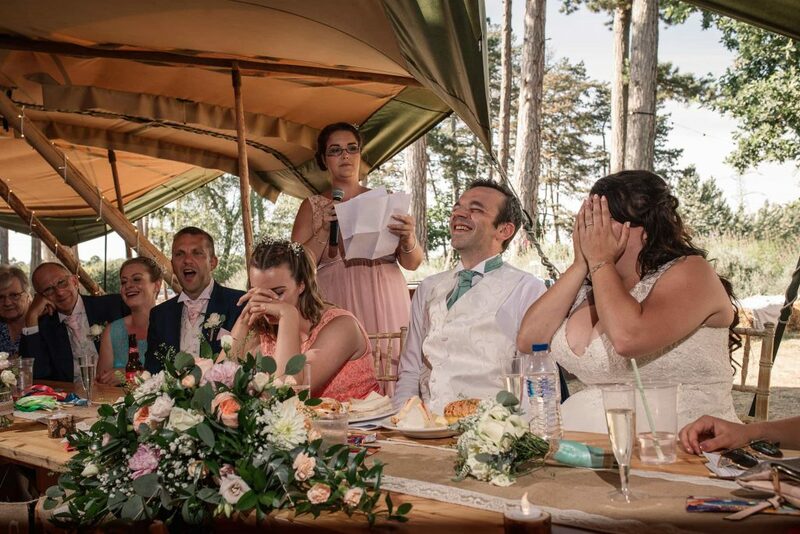 It was a beautiful ceremony, full of lots of laughter and so much love. 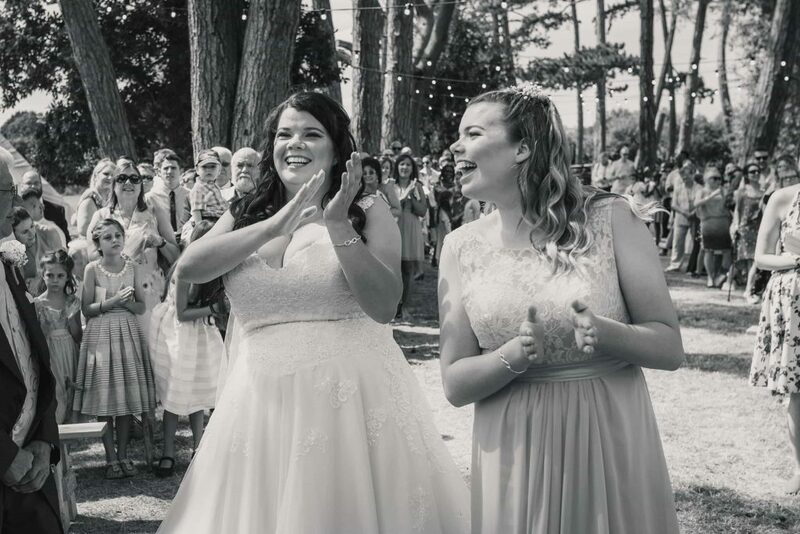 Not only did Claire and Martin exchange vows, Claire’s daughter Paige also joined in as they all became a ‘forever family’ which was such a lovely touch. 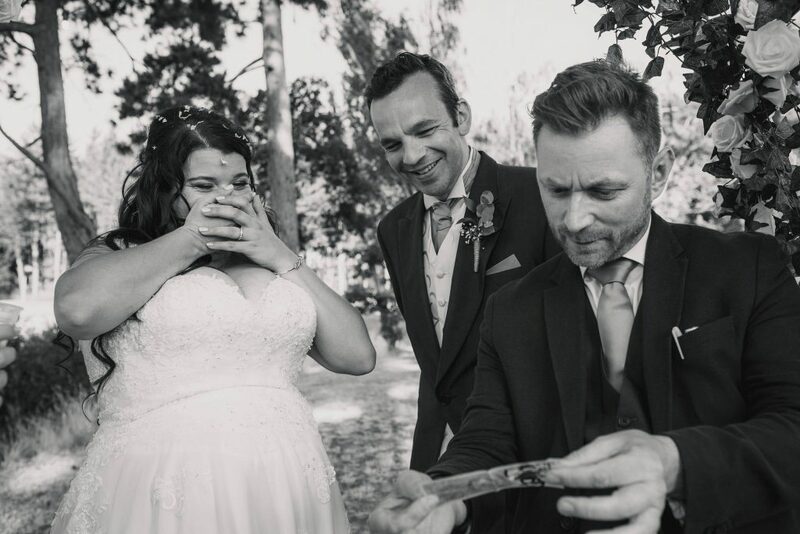 After the ceremony, we did some family photos, which I think are really important. 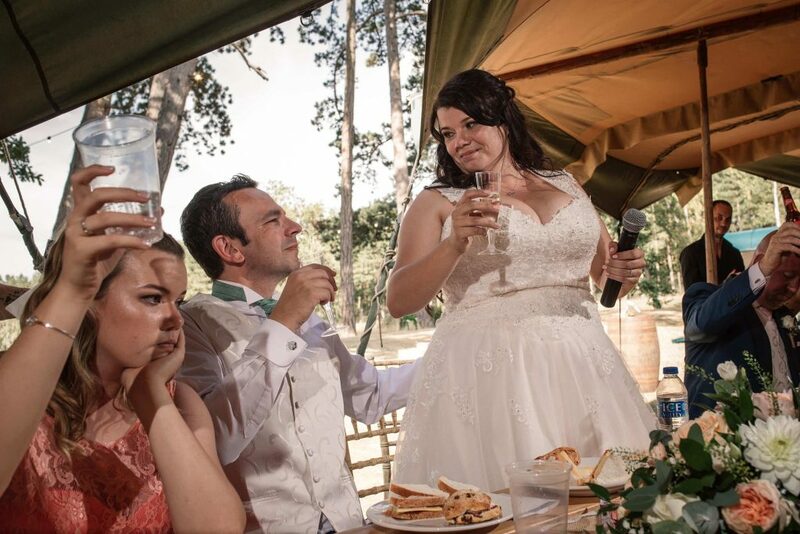 Then the couple mingled with their guests, which was the perfect time for me to get candid photos. 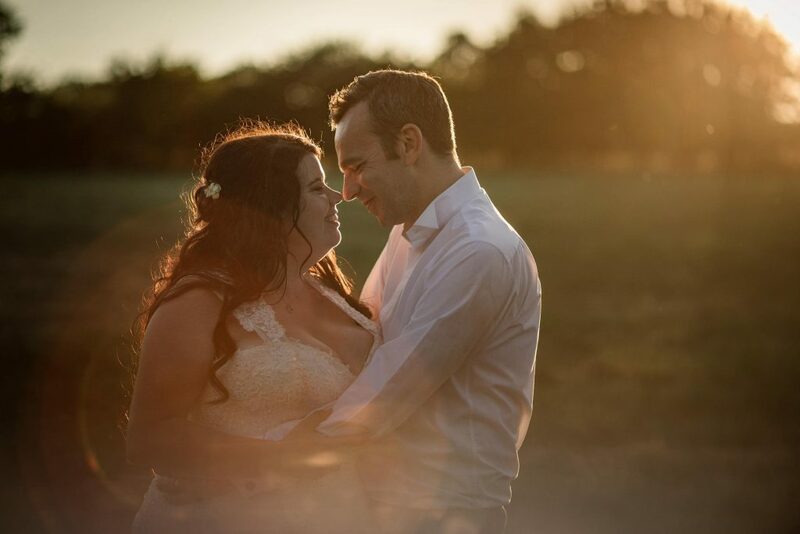 I got some stunning couples photos by the lake, and then some more later on just as the sun was going down, which was brilliant. 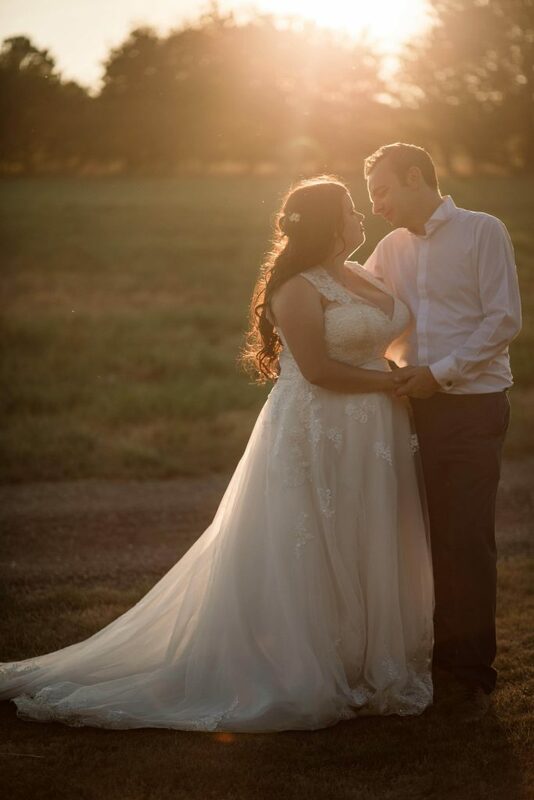 I love a bit of golden light in the evening! 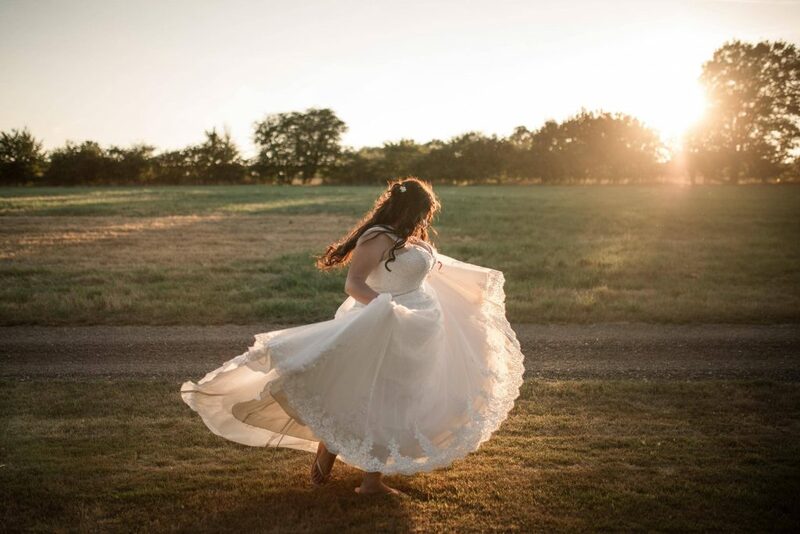 The weather was all sunshine and blue skies, it was a beautiful day all day long. 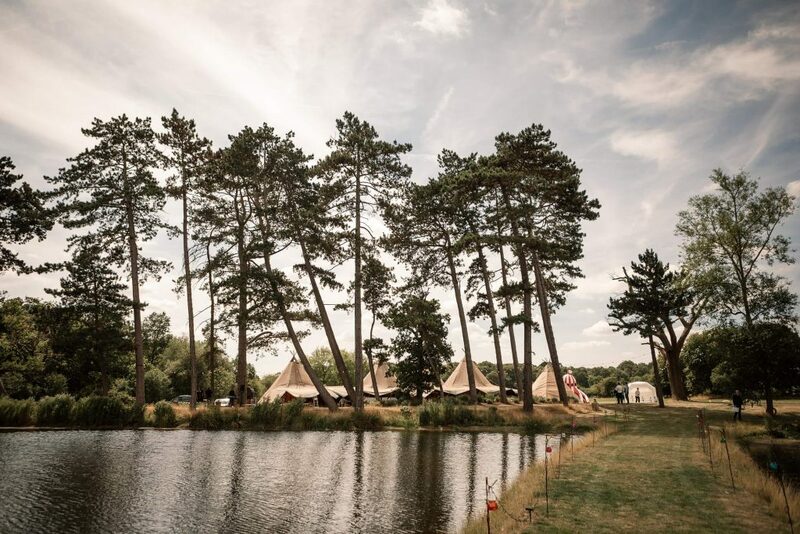 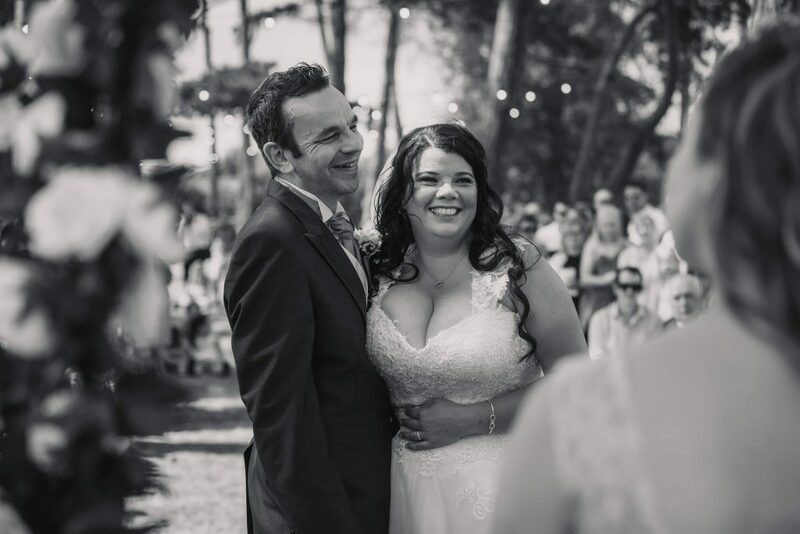 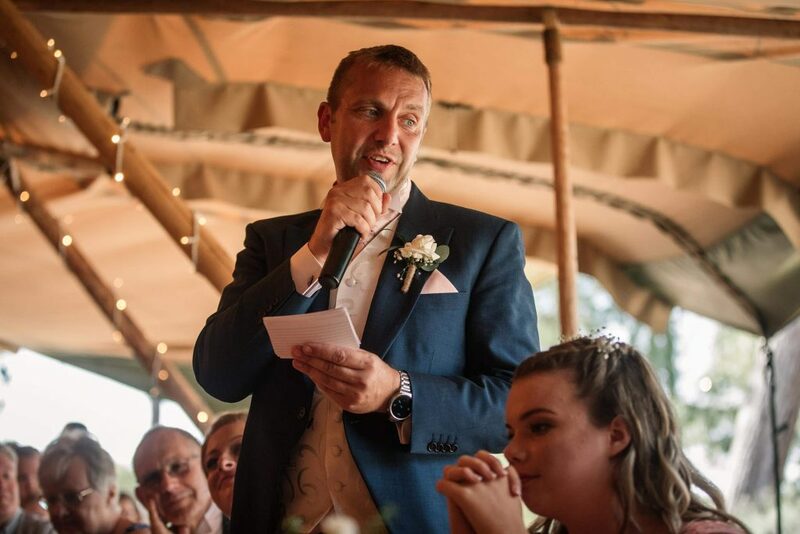 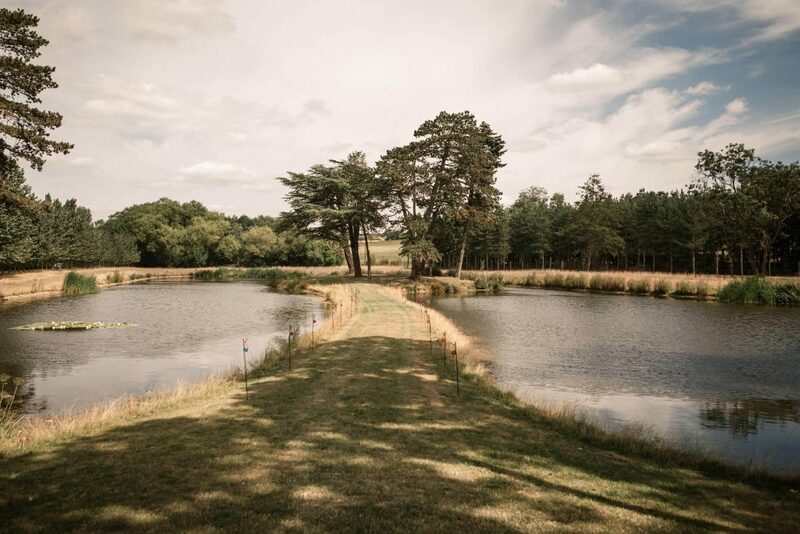 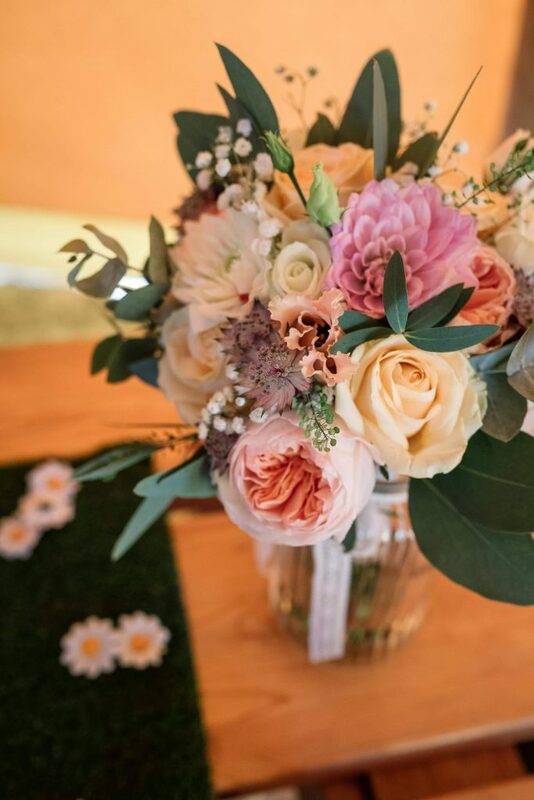 Claire and Martin chose to have their wedding at Brook Farm because it’s such a beautiful setting with the lake, and it has so many options with lots of space to create the festival vibe they had in mind. 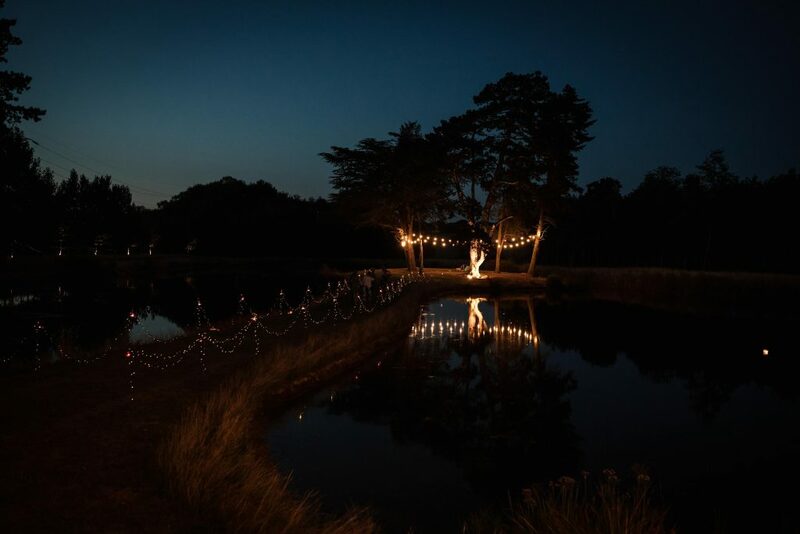 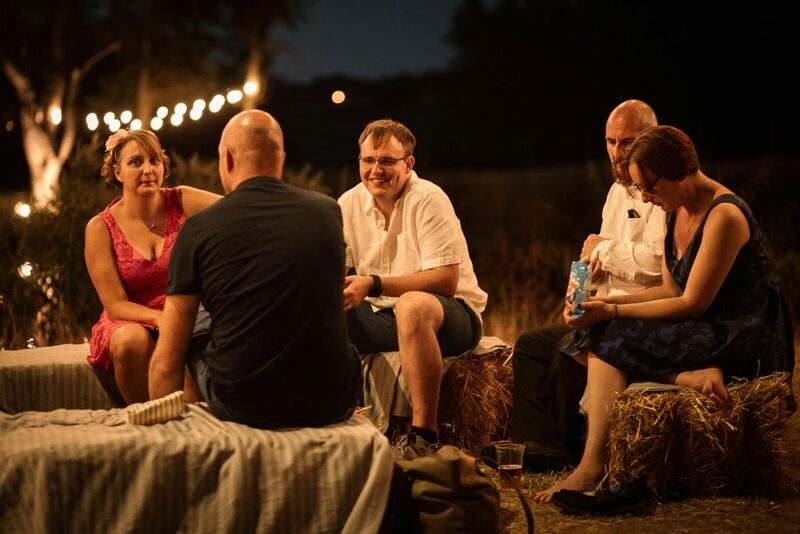 Brook Farm is a stunning farm, and it’s got such a gorgeous feel to it, especially in the evenings when the the festoon lights are switched on! 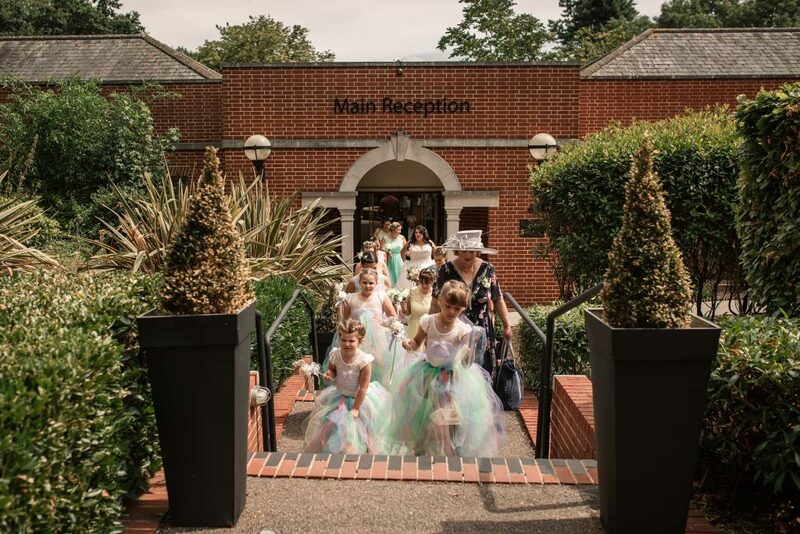 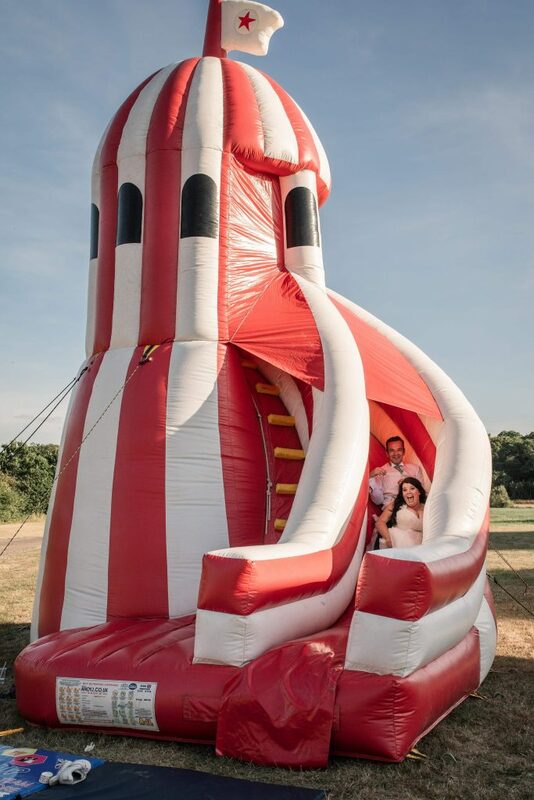 For the reception, the couple had planned a bouncy castle, inflatable helter-skelter and an ice cream cart for their guests, and everyone loved it. 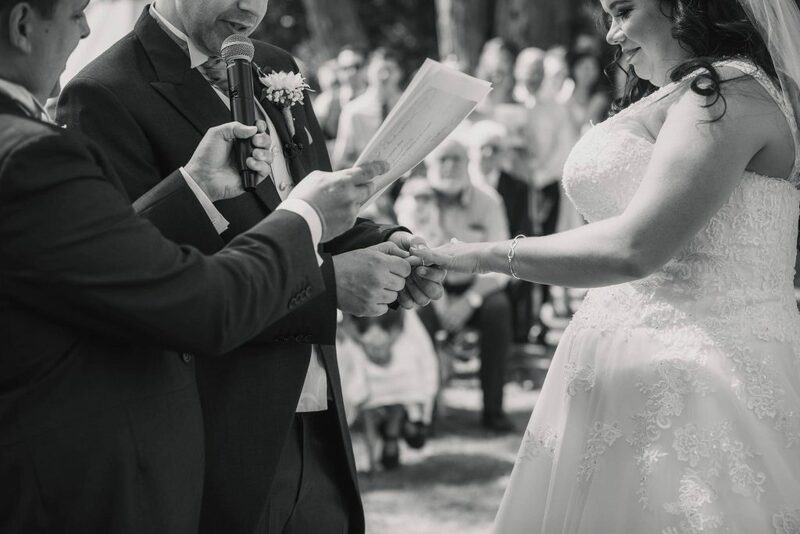 There was also an excellent magician in attendance, who wowed everyone with his brilliant magic. 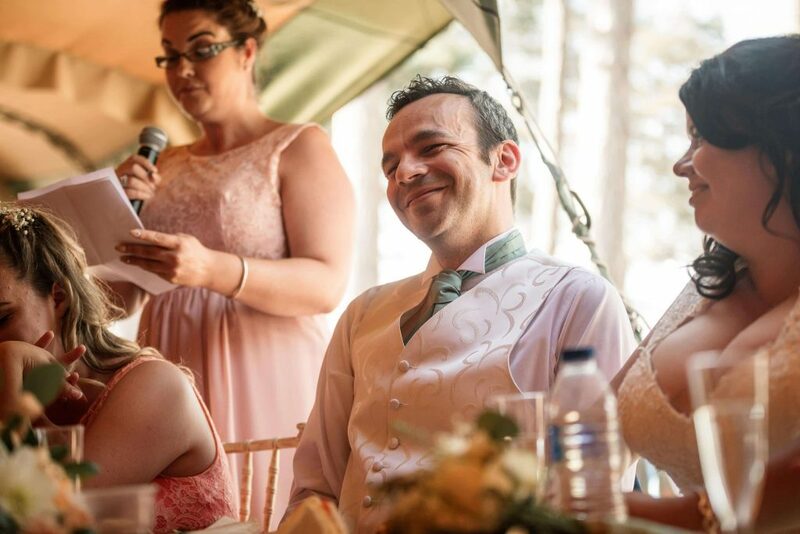 Everyone was then called in for the wedding breakfast, which was afternoon tea and cake. 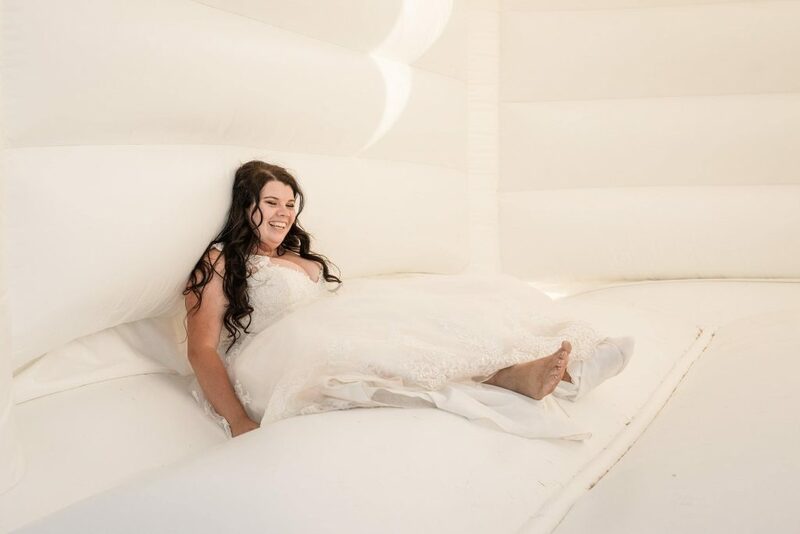 It was such a great idea and really relaxed. 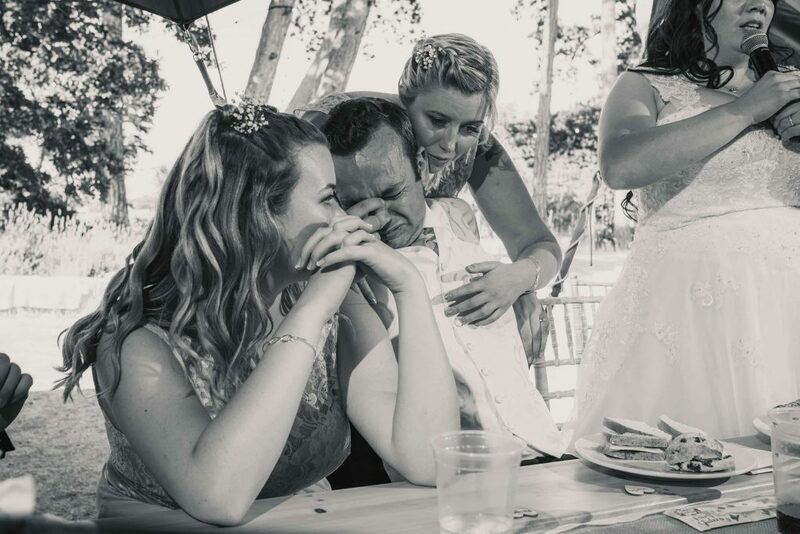 They had speeches after the lunch, which were very emotional. 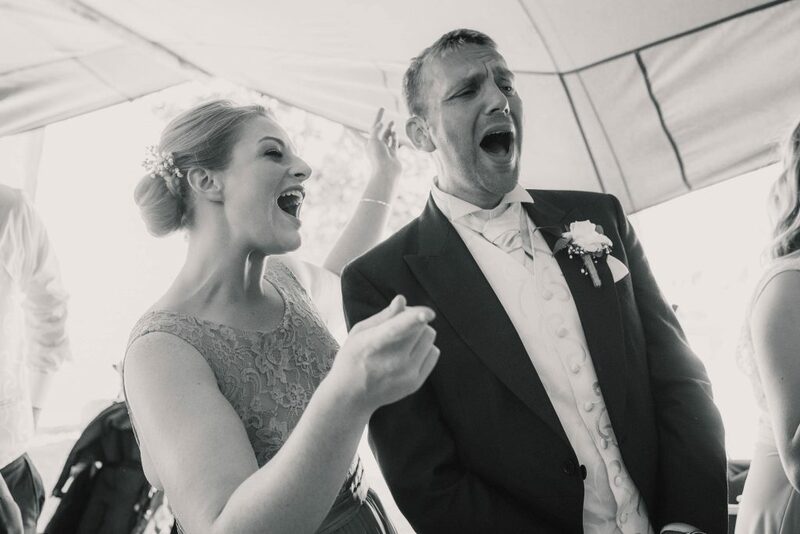 Everyone was shocked and surprised when one of the waiters suddenly burst into song after the speeches – Claire and Martin had surprised everyone with their performance as everyone ate! 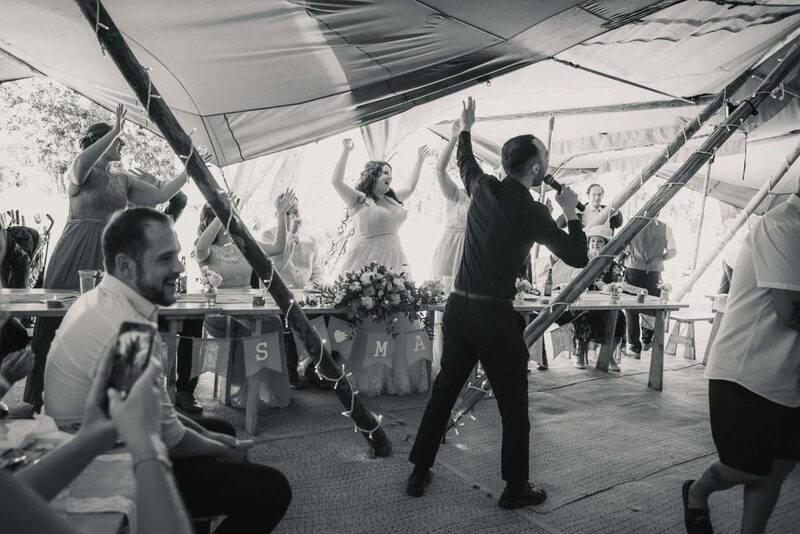 After dinner, the band started up to get the party started, and the dance-floor was a very popular place to be. 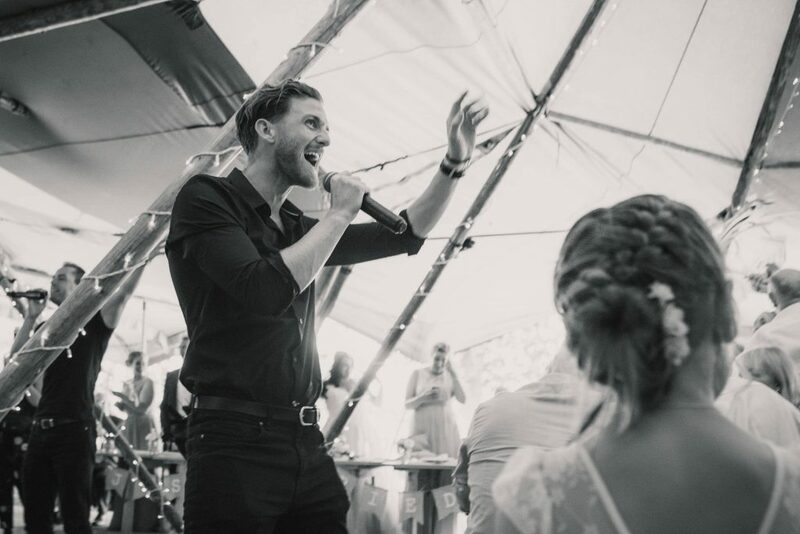 The live band kept everyone entertained all evening. 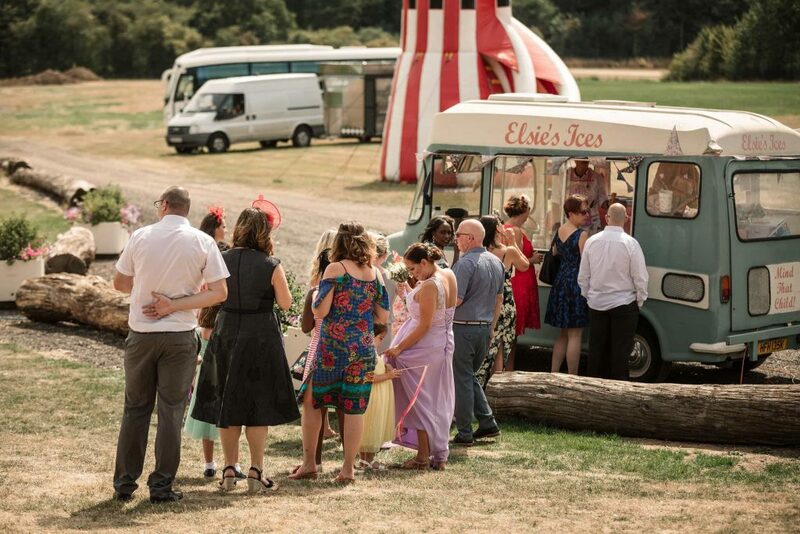 The evening ended with lots of cake and a fish and chip van for dinner, which was delicious. 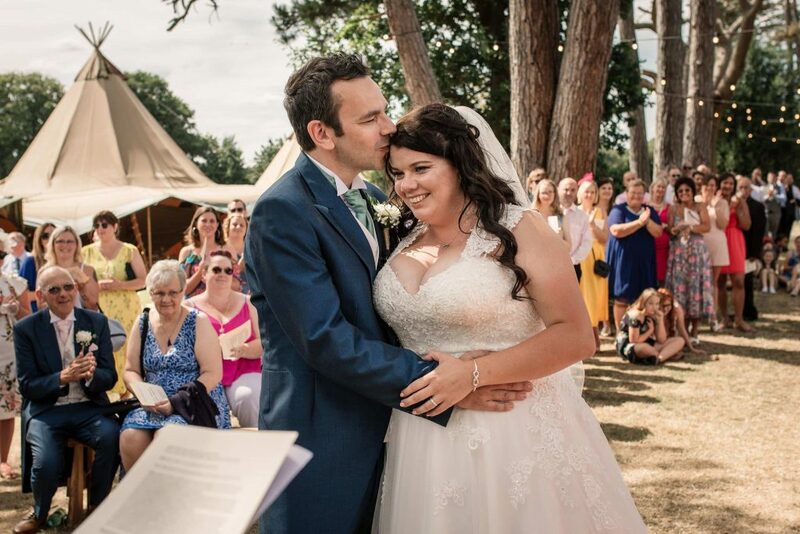 The whole wedding was so much fun, from the beautiful vows to the awesome live band. 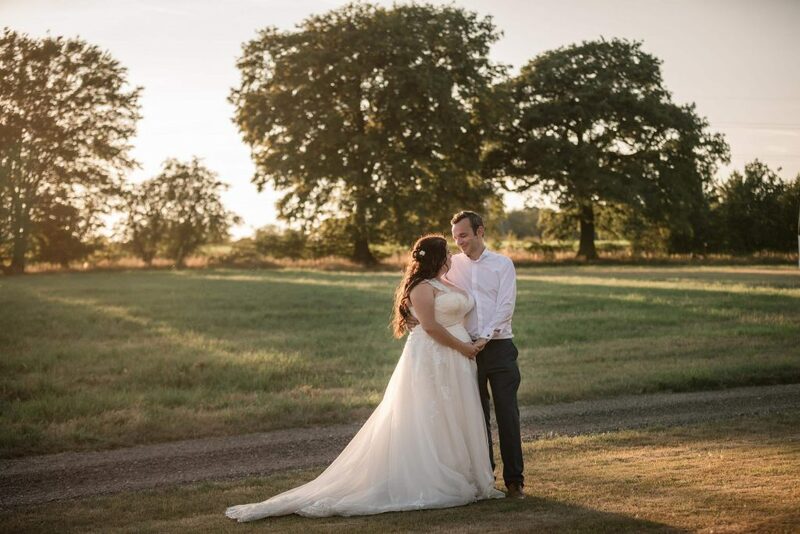 I absolutely love Brook Farm as a wedding venue and it was so special to share in Claire and Martin’s amazing wedding day, as they are such a lovely couple and clearly adore each other. 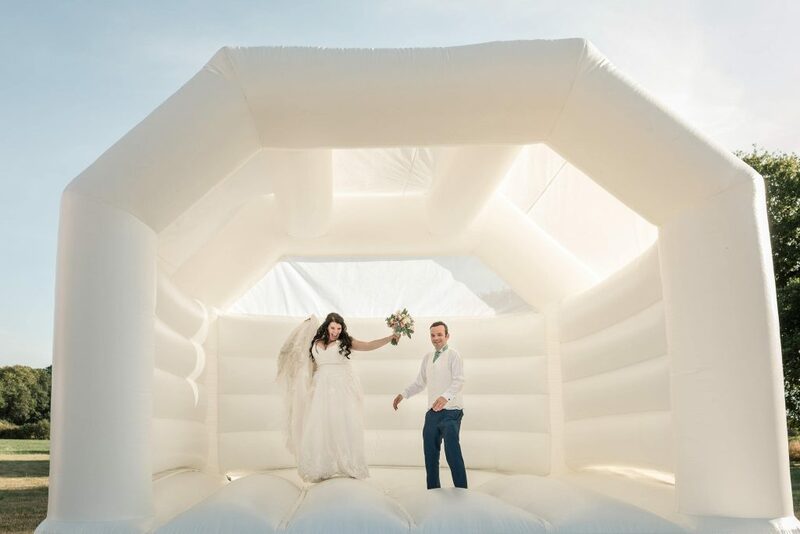 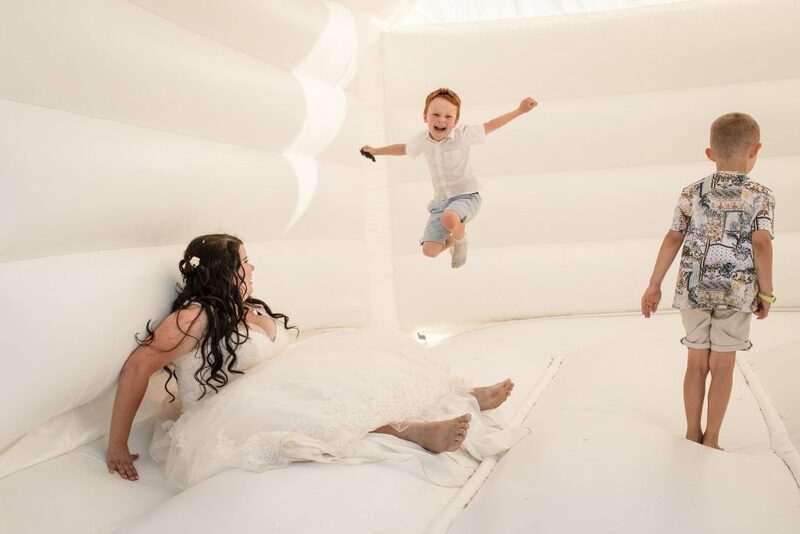 One of the most memorable moments of the wedding was when Claire and Martin took some time to have a go on the bouncy castle, because it just reflected their fun loving personalities! 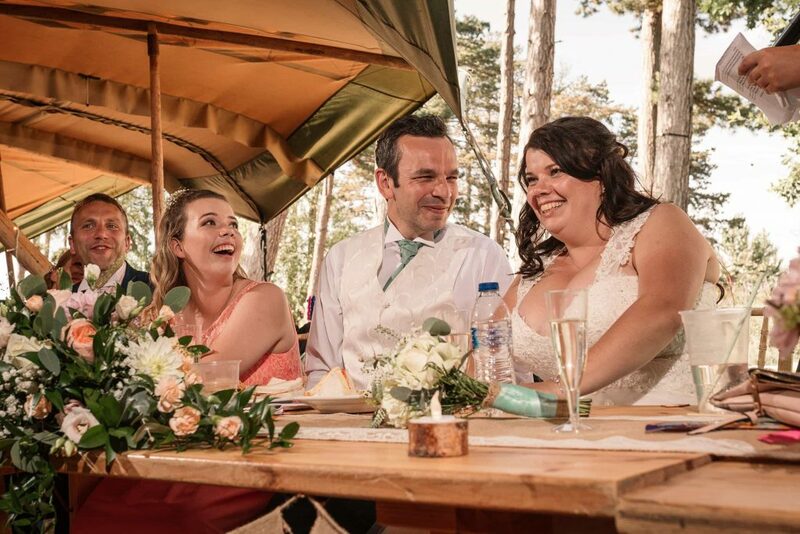 The bar was also a talking point of the wedding – the Swig and Filly kept everyone topped up all evening. 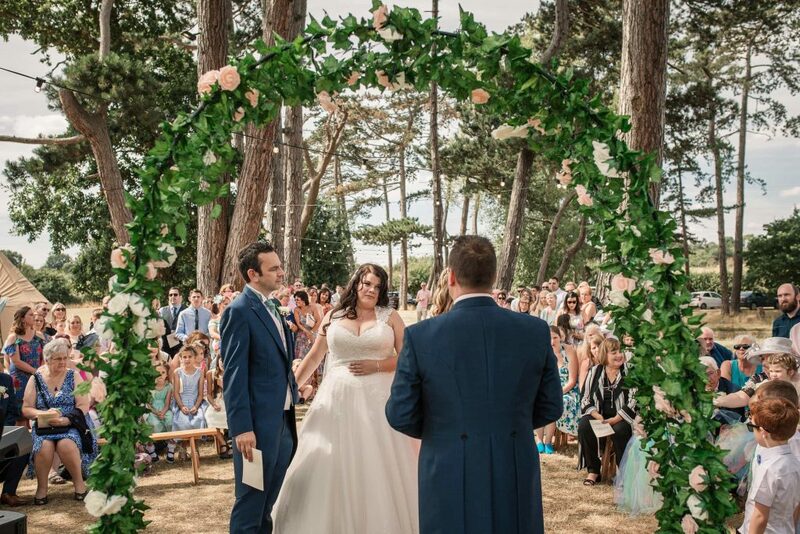 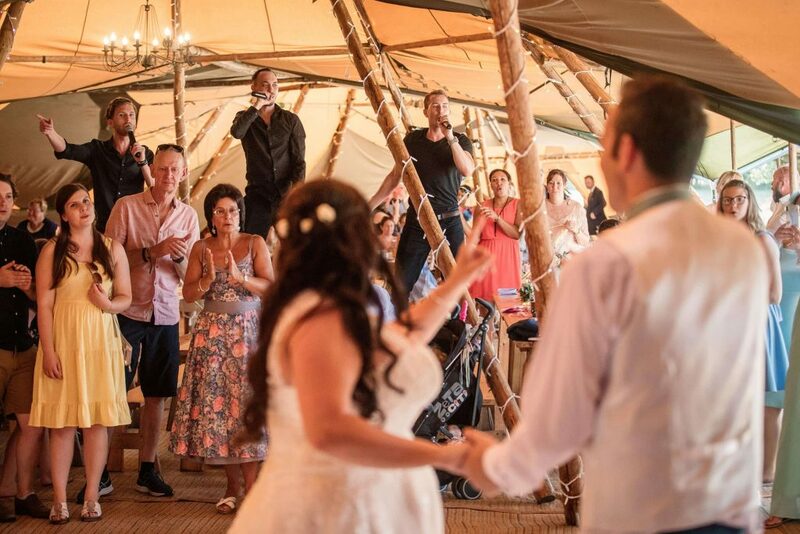 Claire and Martin put so much hard work and effort into planning their perfect festival wedding and it was such an amazing day! 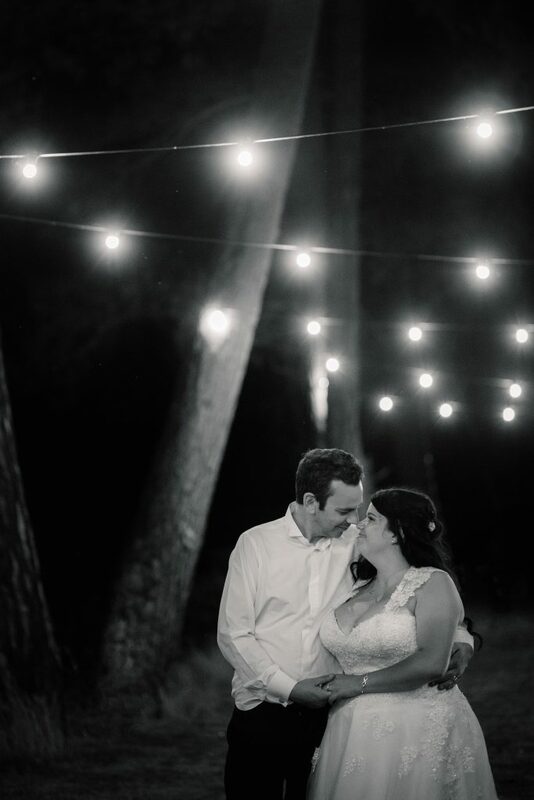 I loved this Brook Farm wedding so much. 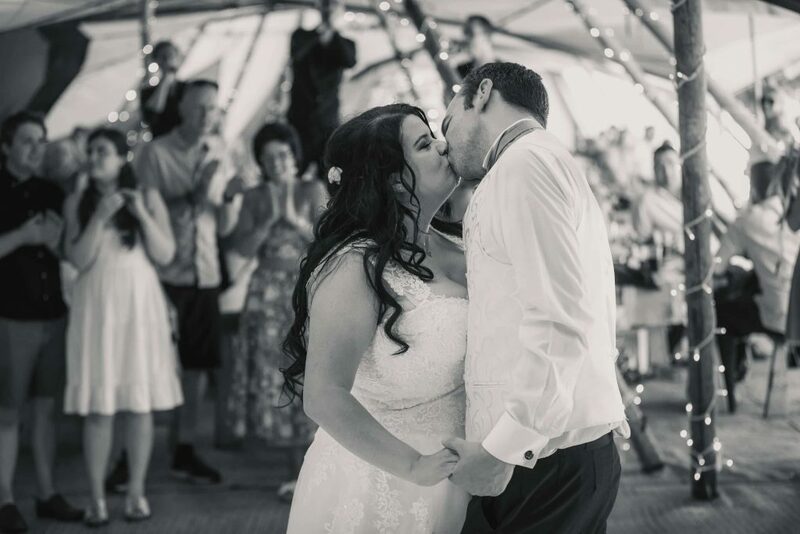 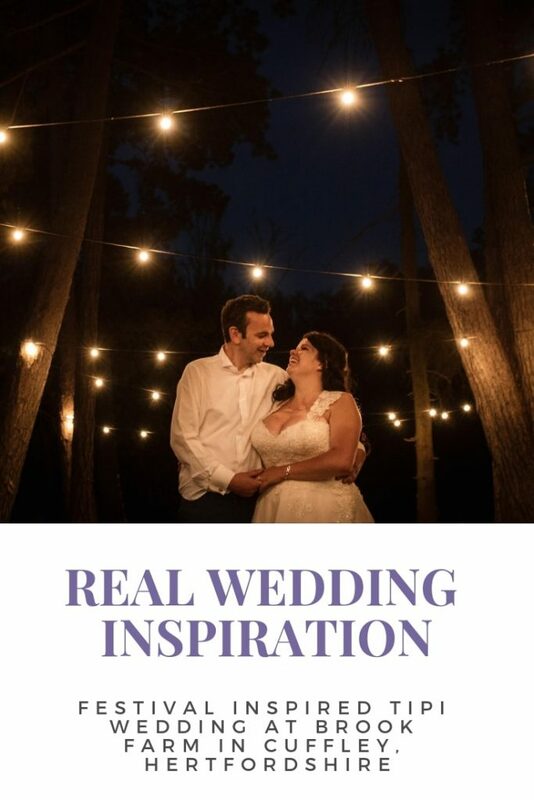 Brook Farm is one of my favourite venues in Hertfordshire – you can see my top ten here. 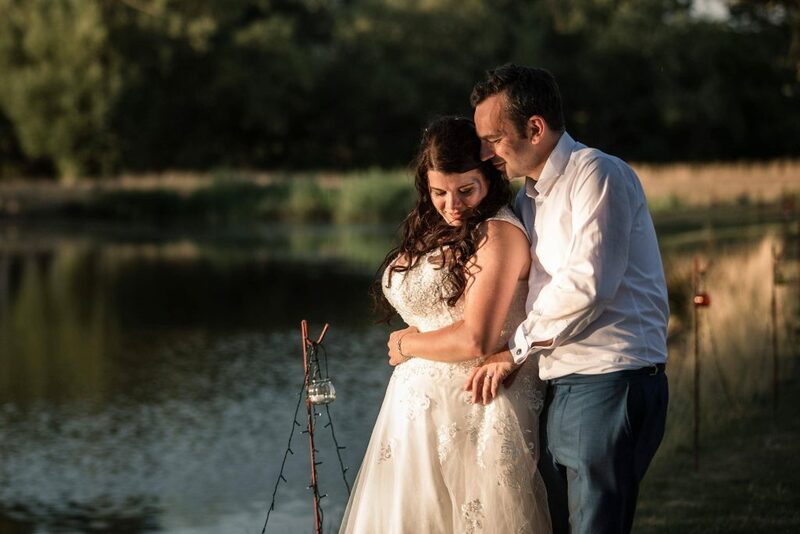 If you’re getting married and looking for a Brook Farm wedding photographer, please do get in touch. 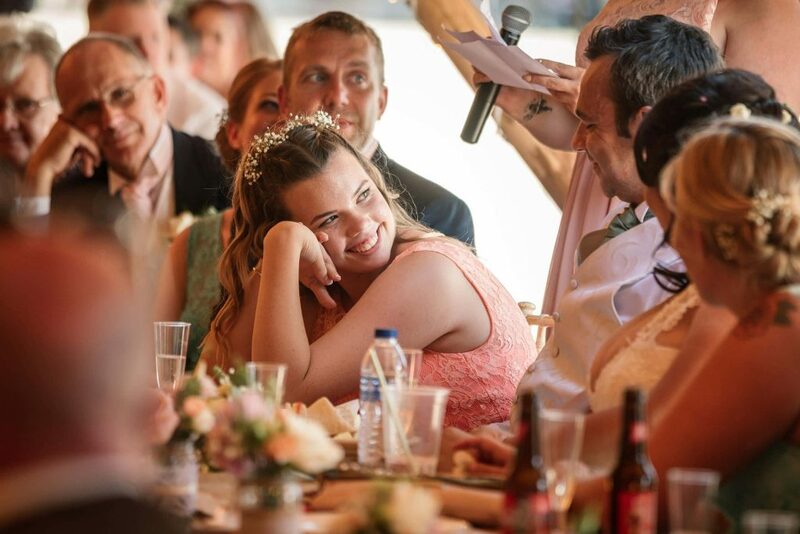 I’d be so excited to hear all about your plans. 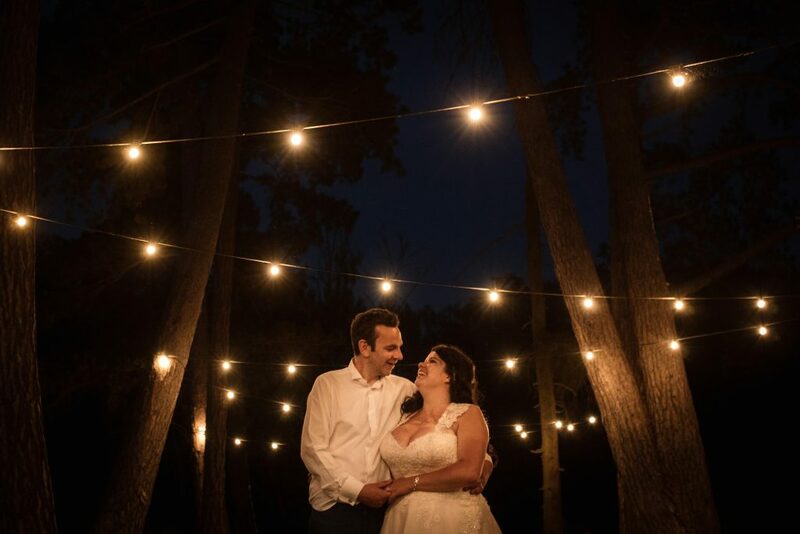 Here are the photos from Claire and Martin’s Brook Farm Festival Wedding!